On June 25th, 1530, at the Diet of Augsburg, several German princes presented to Emperor Charles V a confession of their beliefs. 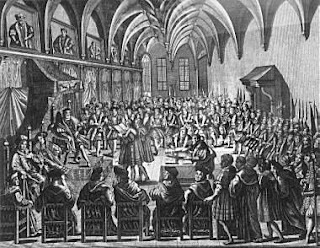 This Augsburg Confession, written chiefly by Philip Melanchton, Luther’s colleague at the University of Wittenberg, serves as the principal statement of what Lutheran Christians believe. Even today, the cornerstones of many Lutheran churches are engraved with the letters U.A.C., declaring their belief that the Unaltered Augsburg Confession is a true and faithful exposition of Holy Scripture. the God of Jacob is our / refuge. the holy place of the tabernacle of the / Most High. God shall help her, just at the / break of dawn. He uttered His voice, the earth / melted. O Lord God, heavenly Father, pour out Your Holy Spirit on Your faithful people, keep them steadfast in Your grace and truth, protect and comfort them in all temptations, defend them against all enemies of Your Word, and bestow on Christ's Church Militant Your saving peace; through Jesus Christ, Your Son, our Lord who lives and reigns with You and the Holy Spirit, one God, now and forever. Amen. in the city of our God, in His holy / mountain. To chasten and to teach. Are born condemned by sin. No person life can win. Who suffered in our place. When e’er the Word is heard. God’s Law his paths gives light. Good works are his delight. God’s gifts we still obtain. In presence here is real. Here in this Holy Meal. The man whom God selects. Our sins He now forgets. In sin and be defiled. In love, forgives His child. Three months ago was the Annunciation of Our Lord, the date when we celebrate the visit of the angel Gabriel to Mary to announce to her that she would be the bearer of the Christ. At the same time, Gabriel told Mary that her cousin Elizabeth was already six months pregnant with the one who would prepare the way for the Christ. So today, three months after the Annunciation and six months before the Nativity of Our Lord, we celebrate the birth of St. John the Baptist. 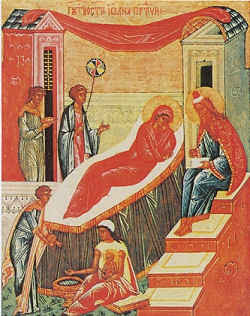 The earliest celebrations of the Nativity of St. John the Baptist are recorded by the Council of Agde in 506. Make straight in the desert a highway / for our God. and to sing praises to Your name, / O Most High. and Your faithfulness / ev’ry night. I will triumph in the works / of Your hands. O Lord God, heavenly Father, who through Your servant Saint John the Baptist did bear witness that Jesus Christ is the Lamb of God who takes away the sin of the world, and that all who believe in Him shall inherit eternal life, we humbly implore You to enlighten us by Your Holy Spirit that we may at all times find comfort and joy in this witness, continue steadfast in the true faith, and at last with all believers attain unto eternal life; through the same Jesus Christ, Your Son, our Lord who lives and reigns with You and the Holy Spirit, one God, now and forever. Amen. before you were born I sancti- / fied you." Was Walther "Too Roman Catholic"? "Whenever the divine service once again follows the old Evangelical-Lutheran agendas (or church books), it seems that many raise a great cry that it is "Roman Catholic": "Roman Catholic" when the pastor chants "The Lord be with you" and the congregation responds by chanting "and with thy spirit"; "Roman Catholic" when the pastor chants the collect and the blessing and the people respond with a chanted "Amen." Even the simplest Christian can respond to this outcry: "Prove to me that this chanting is contrary to the Word of God, then I too will call it `Roman Catholic' and have nothing more to do with it. However, you cannot prove this to me." If you insist upon calling every element in the divine service "Romish" that has been used by the Roman Catholic Church, it must follow that the reading of the Epistle and Gospel is also "Romish." Indeed, it is mischief to sing or preach in church, for the Roman Church has done this also . . .Those who cry out should remember that the Roman Catholic Church possesses every beautiful song of the old orthodox church. The chants and antiphons and responses were brought into the church long before the false teachings of Rome crept in. This Christian Church since the beginning, even in the Old Testament, has derived great joy from chanting... For more than 1700 years orthodox Christians have participated joyfully in the divine service. Should we, today, carry on by saying that such joyful participation is "Roman Catholic"? God forbid! Therefore, as we continue to hold and to restore our wonderful divine services in places where they have been forgotten, let us boldly confess that our worship forms do not tie us with the modern sects or with the church of Rome; rather, they join us to the one, holy Christian Church that is as old as the world and is built on the foundation of the apostles and prophets."